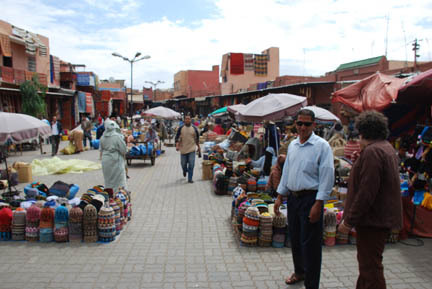 Marrakech is all it is famous for, snake charmers, hustlers, carpets, souk and more. 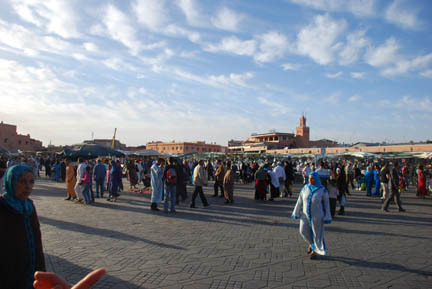 We arrived in the afternoon and following our map headed for our chosen hotel, The CTM Hotel inside the Medina (old town inside the wall) and on the famous square Jemaa El Fna, which the book says has parking and is cheap. The only problem is that the square is a pedestrian only area. We circle the area a couple of times, in madhouse traffic, and cannot find a way into the hotel, so we go to another, more expensive hotel with parking. 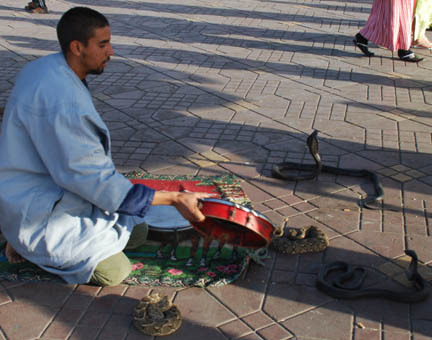 That evening we walked to the Jemaa El Fna and watch the entertainment, jugglers, snake charmers, acrobats, story tellers, etc. It is quite a show. And if you take a picture of something there will immediately be a man right in your face demanding money for the right to have taken the picture. And when you give him some he will say it is not enough and demand more, right in your face. I gave the equivalent of a Euro ($1.60) for the picture and told him firmly that it was enough and walked off. 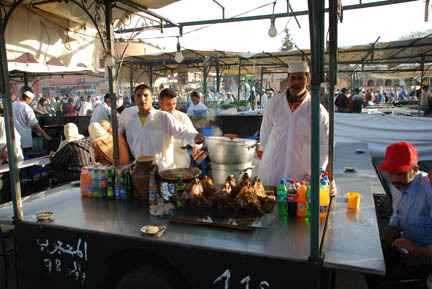 In the evening they set up hundreds of portable food booths with everything from fresh squeezed orange juice to boiled sheep's heads (see picture). 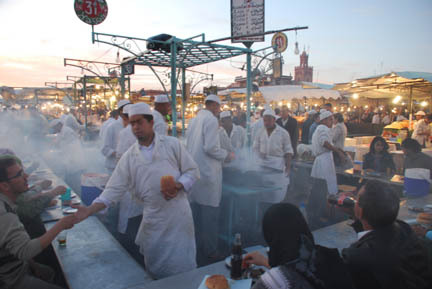 We had brochettes, which are small pieces of meat skewered on a steel rod and broiled over charcoal. As it got dark the lights came on and the smoke thickened. There was a full moon too. But we had all we could stand for the day, after the trip over the mountains, the drive through traffic to find our hotel and the hustle and bustle of the square we were tired and went back to the hotel. 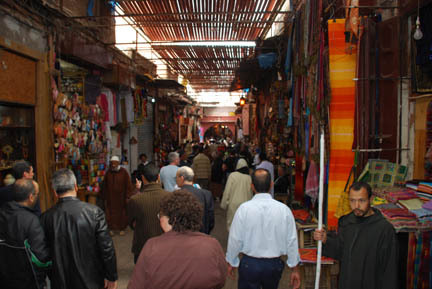 In the morning we went back to the square but this time to walk the souks, the hundreds and hundreds of little shops in the center of the medina. Some of them are only wide enough for one person to stand in. It is interesting to watch a man making a wooden table, without power tools, in a space the size of an American closet. I tried to take some pictures but it upset them craftsmen, so I quit and therefore don't have any of the tiny shops. 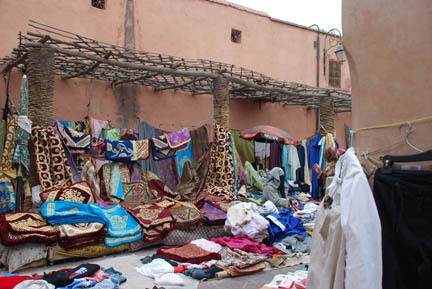 There is everything for sale here, many of the locals shop in the outer edges of it. 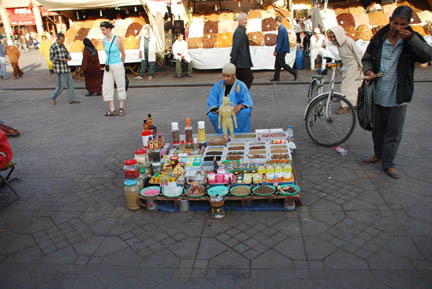 The parts closed to the square are heavy to tourists and all prices are subject to negotiation, sometimes long negotiation over tea if the item is expensive. Some scenes from the area. Water sellers, one can get thirsty watching the action, but it is local water and a communal cup. We bought bottled water Their costume is traditional to their trade and they do stand out in a crowd. The medicine man/pharmacist, he has what you need for whatever ails you. Even a model of a person so you can show him where it hurts without getting undressed. Dried dates and fruits are in the stands in the back. A small square somewhere inside the souks. Those are hats stacked and for sale. 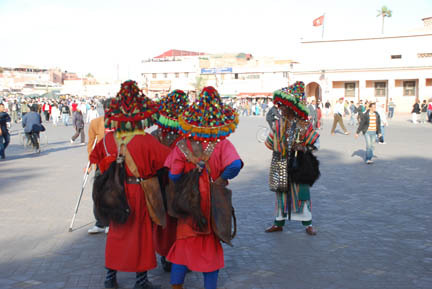 This square was used by Berbers, the same tribe as we visited the day before in the mountains. The man with Kathy is our guide, Fatah. He works at our hotel. 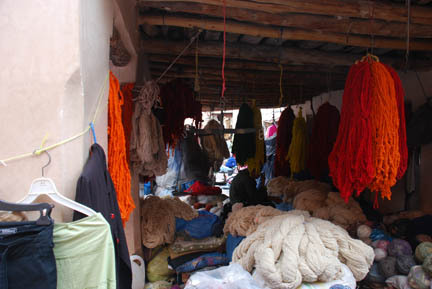 A yarn shop. In case you want to make the carpet, or knit a hat, yourself. 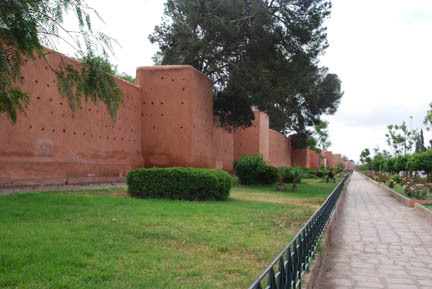 Tomorrow we head over the High Atlas again, but on a better road over a higher pass, the Tizi n'Tichka.